Well, it had to happen. I promised you a posting today on Masks for Protection and then the fabulously entertaining exercises that had been pinging around in my head for days promptly flew out of my ears and left naught behind but a whistling wind. I could not remember what I was going to say to you. I then laid my head gently on the cold surface of my desk and wished I smoked cheroots. This process of transformation from confident blogger to deranged harpy takes about 2 heart beats. ….and thus, I remember what it was I planned to write. Isn’t life weird? These masks pop up all the time: trying on clothes? Think you look more like Michael Crawford than Cindy? It’s because you’re fat, you’ve got no will-power and you don’t deserve nice clothes (The Queen of Pentacles has been perverted). Hear someone saying something unkind about you as you walk past an open office door? Well how DARE tbey? And the Reversed Knight of Wands or Swords works yourself up into a state of High Dudgeon as you endlessly churn over Possible Conversations/Fights that you will have with these people. I usually rehearse these fights ad infinitum in the shower of a morning. I will give myself a heart attack. I don’t, of course, EVER actually have the fight. I like the mask of Confident Blogger. I’m less keen on the mask of Unhinged Babbling Nutcase. Yet, they’re both me. And I believe that the unhinged babbling nutcase is a mask that I put on to protect myself. And to protect YOU. From ME. For me, the mask was trying to protect me from getting hurt or rejected or something ‘they’ll reject you, so you might as well quit now’. It was also protecting YOU from me – the fraudulent, terrible person that this mask pops up to hide. *pauses* am I sounding like a complete lunatic here? Somewhere along the line, a perfectly sensible defence mechanism mutated and I ended up with all these masks. If I can recognise that this mask is just a shield, then perhaps I can stop using it to defend myself (or you) and hang it on the wall as a trophy. Here’s a Tarot exercise to help you work with those masks in particular. Take out all your Tarot Courts. Say hello, because EVERY one of them is YOU. Mostly they are helpful guises, but sometimes they are defensive masks that can really hold you back. So…. First, find the court card that you think best suits the character of the troublesome mask. 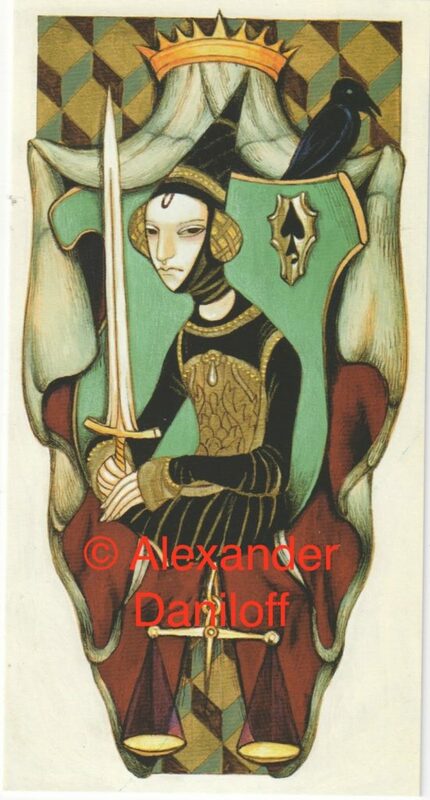 Sticking with the example above, I decide that my critical, false-logic WRECK of a mask is a Queen of Swords reversed. I’m taking her out and having a good look at her. Rightsides up I really like the Queen of Swords. Reversed, she holds me in a self-restricting critical pattern that is really tiresome to experience. She is Water of Air. 1 What are the best things about this character ? list all the card’s great qualities and include those elemental attributes too – water and air can really be productive. Use astrological references …. use whatever you danged well like. 2 What are the unhelpful things about this personna? List those too. I’ve found that this turns into a list of all the horrible stuff that runs through your head when this mask is being worn. If you get stuck, it can be very beneficial to meditate on the card and journey within it. Speak to every aspect of the card, not just the main character. 3 Once you’ve excavated all the good and ‘bad’ about this card (the bad being the negative chat that the mask allows you to indulge in) it’s time to address it. Take the Tarot court and regard it fondly. Hold it with love in your heart – all it has been trying to do is protect you. Talk to it and explain how you appreciate everything that it’s trying to do, but that the method that it’s using isn’t helpful. Reassure it that it’s not being banished, but that you need it to change. Tell it all the things that you love about it. And how you’re now letting all that negative stuff go* ……. And then see what happens the next time the mask thinks about popping up. BTW – I must point out that I’m not a therapist or psychologist, but that these techniques work for me. I hope they work for you. You could even put some clues in the title, Carla. Then you would know what it was about and whether you wanted to work on it? How did you get on with your Queen of Swords then Chloe? Embracing inner nutcase as we speak…..
How'd you get on with it – post when you try it and let me know so that I can see how it all worked out, Bonkers.